An ongoing joke that my friends tell about me is how I am OBSESSED with leftovers. They often poke fun at my “no shame” attitude, and how I am willing to box, bag, or grab anything left on a table. Well, folks, I'm here to tell you that I save a BUNDLE by loving my leftovers! 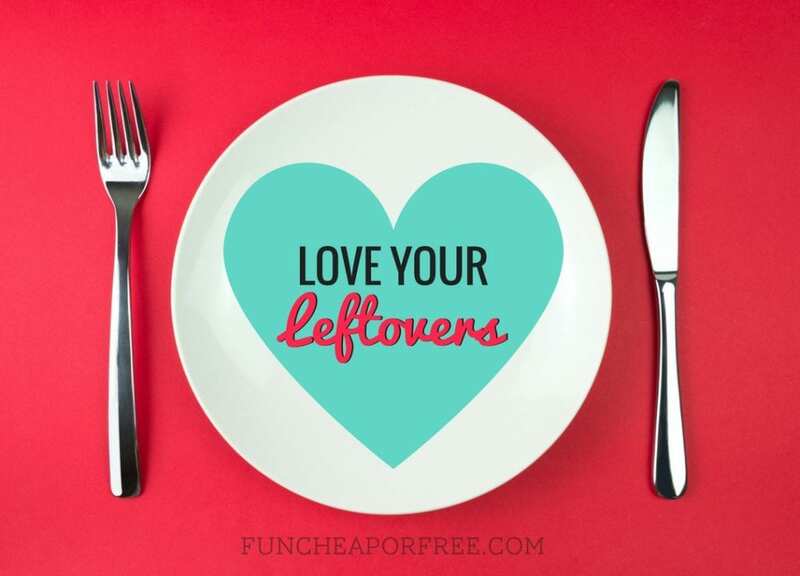 Get ready to LOVE your LEFTOVERS! If I go to a restaurant (using a coupon of course) I nearly always plan on getting at least two meals out of my meal. Likewise when I'm at home, I always plan on getting multiple meals out of one night of cooking. This saves tons of time, money, and helps you justify going out to eat once in a while. When you go to a restaurant, BUY BIG. For example… I recently went to lunch with a friend. We went to Noodles & Company. They have two sizes, regular and small. The regular is nearly double the size of a small, for only $1 more (or so… I'm doing this from memory). My friend got the small because she said she couldn't eat an entire regular by herself. I, of course, ordered the large. I ate half, boxed up the other half, and got two meals out of it for only $1 more! Ask the waiter what specials they have that day. Often the specials are regular dishes that are temporarily discounted, or are new dishes they are featuring for a temporary lower price. 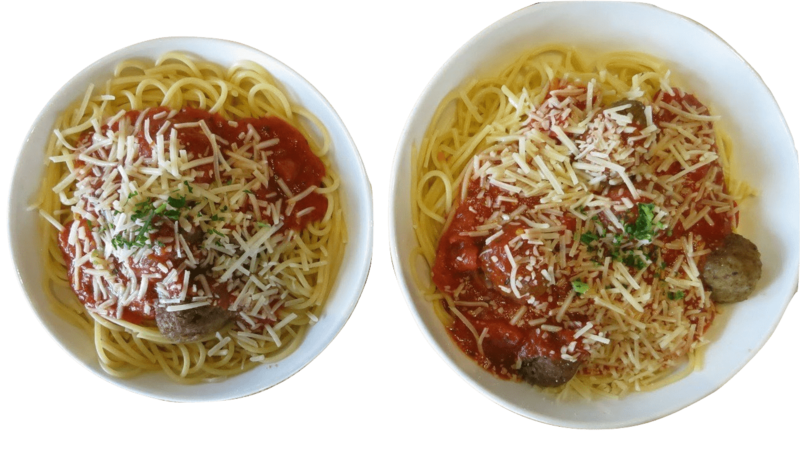 Order the biggest dish possible to get the best value, then (using self-control…) eat half and save the rest for later! When cooking at home, always make generous portions. Don't half recipes. In fact, double them if it's a small recipe! I know this seems like it would be wasteful or could lead to over-eating, but if you learn to love leftovers, then this serves multiple purposes: A) cuts down on your need to cook for every meal, and B) gets more use out of food you've cooked. Double recipes and freeze the other half, using dollar store containers. You have all of the ingredients, you're doing the work already, why not cut down on future cooking? This way you have meals stored away for a rainy day, or you can give a meal away to someone in need. Plus, when you BUY BULK (which you should!) you'll have plenty of food around to work with. If you want to learn more about making freezer meals, check out this post! It has 31 freezer meals I made for $100! Stock up on plastic airtight containers. I, personally, hate saran wrap and find that it doesn't keep leftovers very fresh. 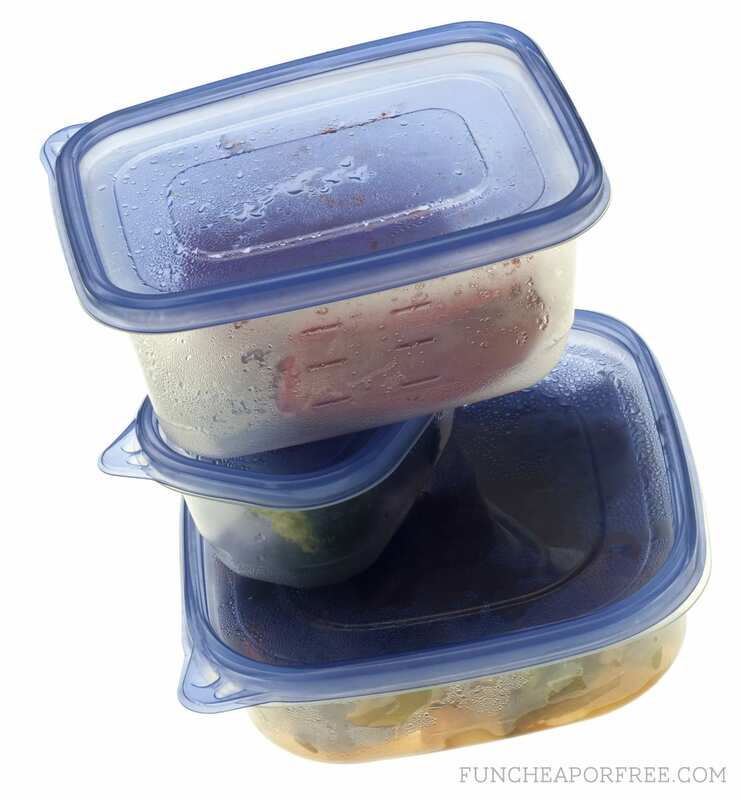 Use airtight containers and your leftovers will stay yummy for up to a few days! When you take food home from a restaurant in Styrofoam or cardboard containers, immediately transfer to a container. It makes a big difference on how long things stay tasty. Take everything home from a restaurant. Have no shame! Get creative with saving your leftovers. I will even take home leftover steak fries from Red Robin (because they are my favorite!). We've all learned that fries go mushy in the fridge after a day. However…throw them on a baking sheet, broil for a few minutes, and voila – crispy and delicious again. If the bun on your burger goes soggy, take the bread off and make it into a lettuce wrap, or add a new fresh bun. Ask for sauce on the side. 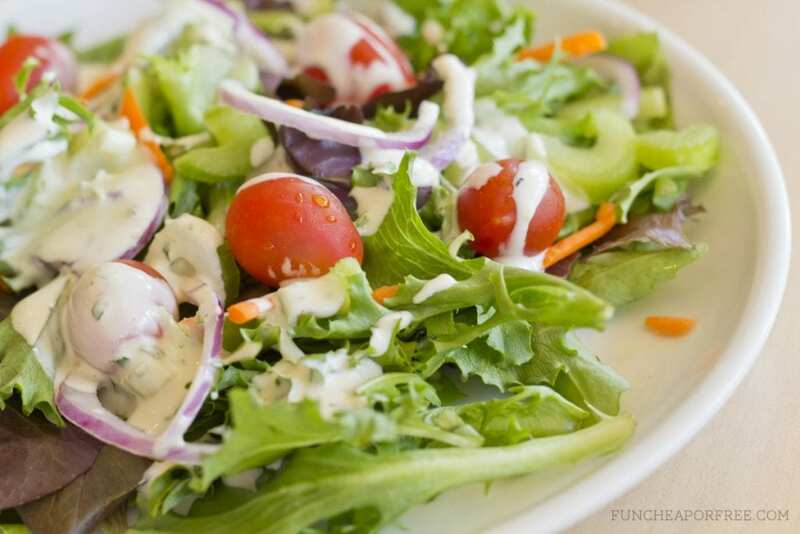 If ordering something like a salad or a big sandwich, ask for the sauces on the side. Keeping food sauce-free helps them stay better in your fridge for a few days. Get creative with home-made leftovers. If you make chicken and rice on day 1 and don't feel like eating it again on day two, shred the chicken and add it to burritos. Throw it over a salad. Add it to soup. There are tons of ways to get plemty of leverage out of leftovers. 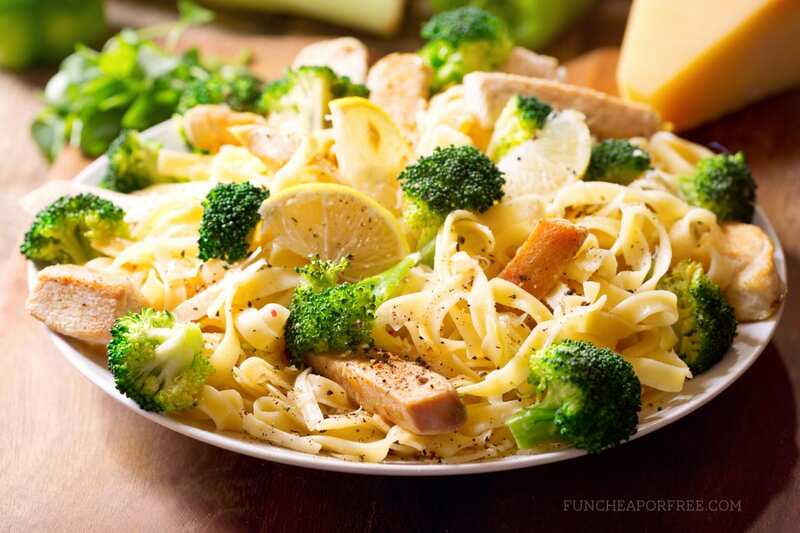 Plan your meals around leftovers. There are many sites out there than can help, here's one. Here's another. This post also gives great meal planning/leftover ideas and includes free printables. LOVE LEFTOVERS. No one is “too cool” to save, so don't be bashful or feel “dumb” when asking to box up leftovers. Even if it's only a small amount of food, this really will help save you TONS in the long run. 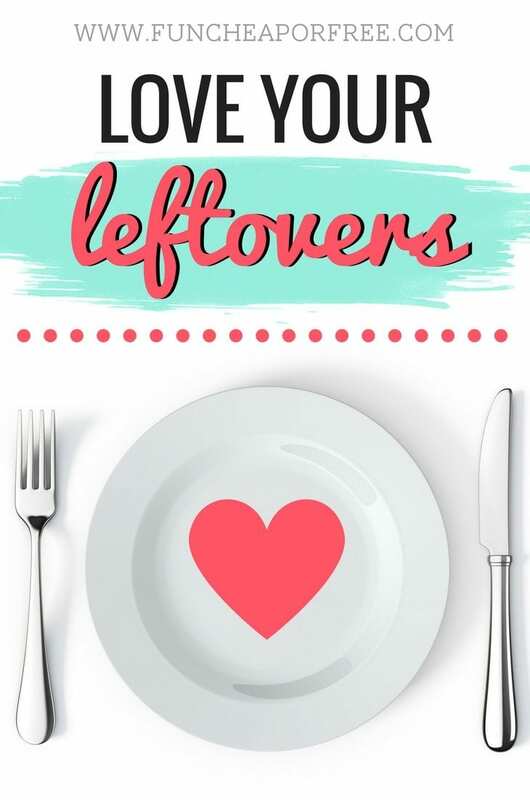 I hope those tips and tricks help you learn to love those leftovers! Don't let your time of not eating out end with the challenge! Keep it up! Set a goal for next week that you are going to cut your cooking in half, and try to get at least 2 meals out of every 1 meal that you buy or cook in the coming week! I just wanted to tell you how much I have enjoyed the challenges this month. My husband doesn’t really get all the things I do to keep our spending and grocery budget so low. It takes self discipline, creativity and a challenge. For me it is like a game but would be so much more fun if he was into it and we could do it together. Doing them with you and your followers gives me “someone” out there who I can do it with. I know, no I don’t know, how you do everything with all your little ones and all your commitments and even though I am 54 and my youngest is 18 I so enjoy your posts. Would you ever consider doing monthly challenges for each month. I know it takes a lot of time to think up different things to do each week but I love them!! Thank you for all that you do. I am a Texas girl so not near you but if I were I would definitely go to some of your workshop events. Anyway, THANKS for this month! It’s really helped me a lot! I’ve saved nearly $200. I’m so proud of you, and that’s so exciting!!! Thanks for following along, I’m so excited for you and that $200!! I have to be better about doubling recipes and then freezing them. How long do you think they last in the freezer? I may be overdoing it with all of my March goal setting, but I’m adding another.. repurposing leftovers! We NEVER eat leftovers. I always feel bad cleaning out my fridge of leftovers, we throw away too much food!